With these eagle pencil drawings, my aim was to try and illustrate the freedom and power that this bird emanates. We say that eagles represent those two things because of the way they soar gracefully, high up in the air. 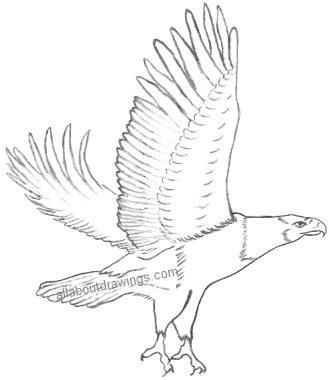 Try copying this eagle drawing outline and see for yourself that it is achievable. I started by drawing the wing and the rest just fell into place. Remember that you draw the details in last, after you are well and truly satisfied with your outline. Practice doing the feathers on his body. It takes a bit of patience but if you fiddle with it you can get very realistic eagle drawings. Oh, and don't forget to keep your eraser handy! This is the sketch I completed after copying the outline and adding in my own details. I confess I was a little bit short of time so I didn't really get the best look happening for the feathers. 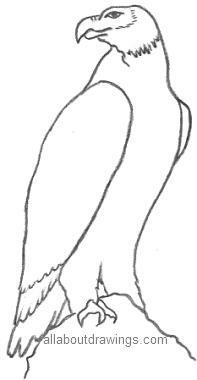 As you practice drawing the eagle outline, you eventually get the feel of contours and shape. I think the feathers around the neck are its most distinguishing feature so with time permitting, that makes a great focal point in your artwork. 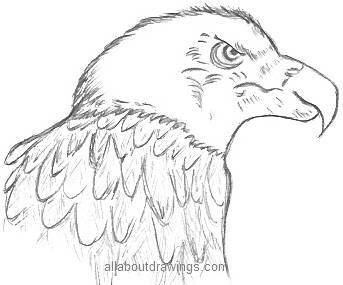 I gave myself the assignment to quickly sketch some eagle pencil drawings and I thought they came out pretty good for someone just starting out as a hobby artist. That proves it's not a hard subject - well, it's not the easiest, but not the hardest either. Eagles are large birds of prey and they are one of the largest and most powerful birds in the world. Up close, eagles look fierce and proud. We know for a fact that they don't like humans so we don't get a chance to study them closely. The bald eagle has white feathers on his head and is not really bald, the white just makes him look bald. An eagle's nest is called an eyrie. A female only lays two eggs a year and it is unusual for both eaglets to survive. The older eaglet takes most of the food and attacks the smaller one and may kill it. Eagles hunt only in the daytime and their prey consists of rabbits, hares, squirrels and birds. The head is large and covered with feathers. The eyes are on the side of the head and they have very keen sight. The beak is large and strong with a sharp hook at the tip. An eagle is brown and black but some have white areas. It has strong legs and feet that are mainly bright yellow. The talons or claws are used to seize and kill their prey. The long broad wings easily support their weight. When an eagle soars, the feathers spread and bend up at the tips. Life expectancy is about thirty years and up to fifty years in captivity. There are 48 kinds of eagles in the world. So, what do you think? Do you estimate the outline is easy enough for you to successfully copy? When I started to do these eagle pencil drawings I studied the eagle first - it is amazing what detail you pick up from that initial once over. 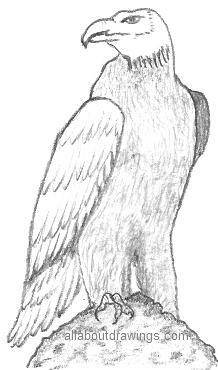 Then I sketched the eagle drawing outline and thought it looked okay so that encourages me to continue. This is my favourite illustration out of the selection shown here. It doesn't matter how long I've been drawing for, it still surprises me that I can achieve even a slight resemblance. That goes to show how much it gets ingrained into us that we can't do certain things when in reality everything is possible. Please don't disregard the power of your mind, if you want to be an artist, go for it! With consistent practice, I was able to do some eagle pencil drawings in rapid succession. If you continuously draw a subject over and over, you'll become very adept at that particular thing. I wish you every success with your drawing experiments.